Jason Harris wins the Pro Nitrous class at the US 131 Motorsports Park Summer Drags with a 3.724 at 201.5 mph. 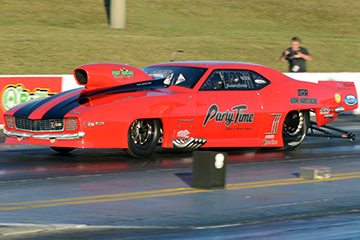 After winning six of eight final rounds and securing the 2014 Pro Nitrous world championship in the PDRA’s inaugural season, Jason Harris has struggled to return to the winner’s circle in the Boone-Harris Racing ’69 Camaro. Harris earned the final-round win on the starting line, using a substantial holeshot advantage and 3.724-second pass at 201.52 mph to defeat No. 2 qualifier Jim Halsey’s 3.674 at 205.39. The Fuel injection, Ignition and Nitrous systems are all controlled by the EFI Technology R8 ECU and new C1 Ignition System.